Quilt Story: Fabric Tuesday #31 and projects! So my older boy in front, Sawyer, says to his little brother, Oliver, in back: "Ollie get in! We're going to the fabric store!!" We all had a really good giggle. Except my husband when I told him. Good thing he doesn't read this blog. He's concerned with our boys knowledge of fabric. The other day Sawyer was mad at me and thought of the worst thing he could say to me, "Mom your fabric is NOT cute!" And yay! I actually have something to share this week! Heather and I are working on patterns so much we can't share anything until the pattern is done. But I have a little baby shower to attend tomorrow and I put this together for the first time mommy. Ugh. Can you spot my mistake? Okay, that's risky to put out there, I'll get comments like "Well I think your stitching could have been straighter" and "the font you chose is lacking..." I'll just say what it is. I forgot to stitch the inner circle on the "a"! Boo!! Gotta fix that tomorrow. And I backed it with some yummy minky. Makes for such a fast blanket, no batting needed. And I LOVE this Ann Kelle Ready, Set, Go! line for Robert Kaufman. Actually I love all her stuff. 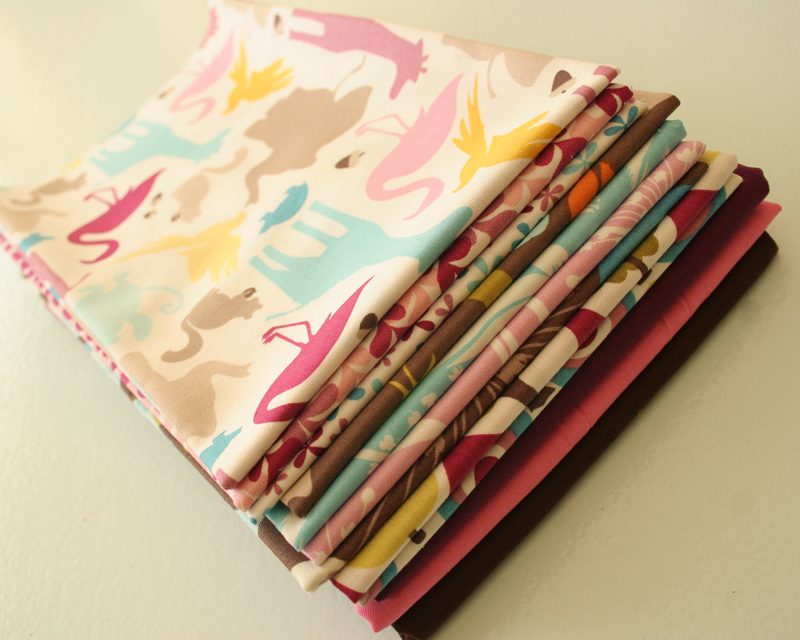 And next, this delicious pile of fabric. Makes my heart beat faster. 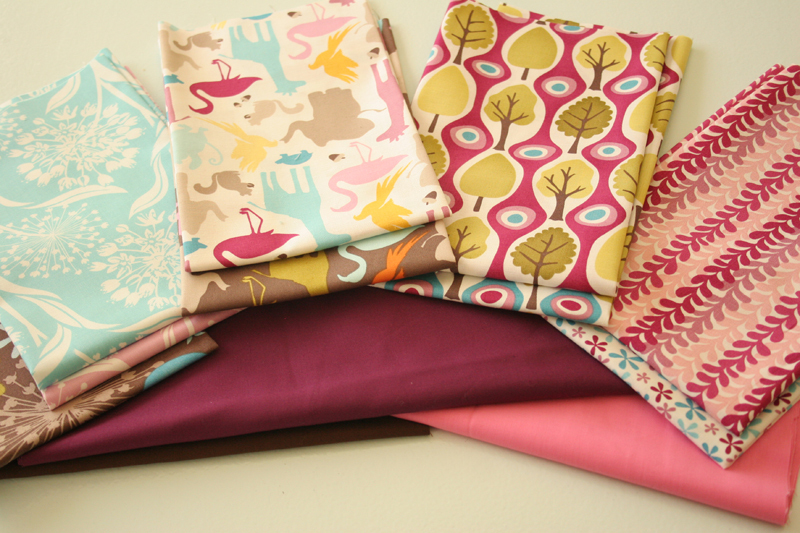 Heather and I had a 20 minute conversation today about how we're addicted to fabric. Sincerely addicted. More on that another time. I got these stacks (minus the solids) from the Fabric Shoppe. It's Central Park from Kate Spain. I couldn't resist cutting into it and making a pattern from it immediately. If you are new or need a refresher, our rules can be found here. ALSO, if you have quilt block tutorial(s) on your site we'd love for you to link to our permanent linky party here. I just made a a baby quilt with Central Park. It is such a fabulous line of fabric. I hope to make something for ME someday, LOL. Haha!! My two year old has been playing "going to the fabric store" for the past week strait! It cracks me up, she'll put on her shoes and grab her purse, wave goodbye, and tell us she's "going to the fabric store" When she returns she's talking about "oh pretty fabric!" lol. I love it!!! i got nothin to post but i hafta say i thought you were giving away that lovely stack of fabric - what a tease! and i love the funny stories. Ha, ha! Too funny. I can totally relate to the trip to the fabric store. Once my son saw a commercial on TV for lotto tickets. The top prize was $250 000. He said I should buy a ticket because $250 000 would buy a lot of fabric! Thanks for hosting as always! I love the blanket, especially with the name. What a nice gift! Haha! Your boys are too cute! And the blanket is adorable, I love how you personalized it. That is a great gift! Those little imperfections make it special ( at least that is what I tell myself). Your quilt-blanket is so sweet! Very good idea for a quick baby gift. LOL! I love what kids say! Recently we were talking about fire safety at our house, and the kids said, "Don't worry, Mom, we'd help you carry out all of your fabric!" 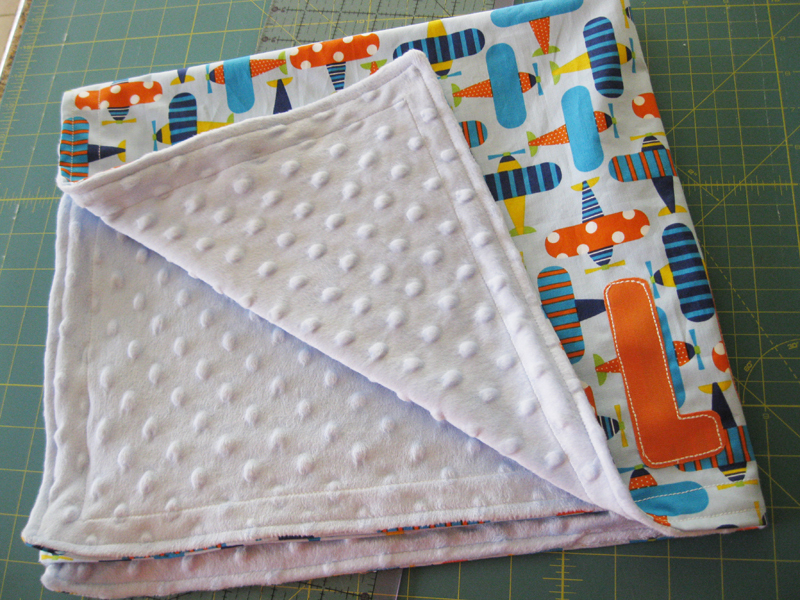 Such a cute baby blanket. And I wouldn't have been able to resist making something out of the Kate Spain fabric either. "Ollie get in. We're going to the fabric store." Oh how that made me smile. Your boys will grow up to be men that smile when their wives are happy because they have a great hobby! 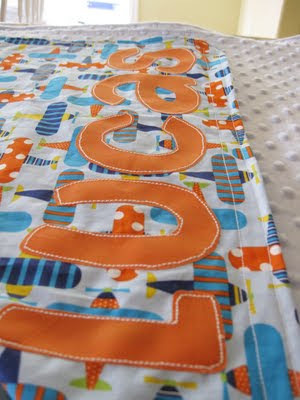 :) And I love the blanket, even without the stitching in the A!